Today I’m excited to share a different kind of post. I get tons of questions about how to start a blog, and how I started, and people are always interested to know how I made this blogging thing into a career. So today I’m sharing just that! I probably need to start at the very beginning. When I was newly married and still in college, I was studying at BYU in their art program. I loved art — specifically drawing and painting — and planned to make that my career. I lived out of state (I grew up in Las Vegas), so my mom suggested I started a blog to document the art I was creating in school. Did you know that’s why it’s called Merrick’s Art? Fast forward a few years, I graduated from college, was studying under a few local artists, had quit my day job, and was staying at home with my first baby. I really loved art, but I was feeling increasingly frustrated by it because I just didn’t feel creative. If you gave me a photograph, I could create a pretty painting from it (and that’s mostly what I did), but I didn’t have any fresh, creative, or new ideas, and the thought of coming up with a show of 10 or more cohesive and themed paintings just made me want to puke with fear. I had artistic creative block, always. Around that time, my mom got a new sewing machine and gave me her old one. I’d taken sewing classes for a couple of years in middle school so I knew the basics and had made some very nice pillowcases, pencil holders, and pajama pants (ha!) but I hadn’t sewn anything in over ten years. Also around that time, Philip and I cleaned out our closets and made a donation pile. I happened to weed through that pile and snag an old polo shirt of his, and with my new machine I worked a little magic (actually there were plenty of mistakes from this newbie seamstress) to make it a shirt for me. I happened to post that on my blog, which had now become less of an art blog and more of a post-whatever-I-want blog, and it happened to be right around the time Pinterest was making its big debut. And the post went viral. Well, as viral as a tiny art blog clothing refashion could go back in 2011. It got pinned thousands and thousands of times, I got a ton of emails, and for years it was the most viewed post on my blog. Have any of you been around since then and remember this?? I had people emailing me, asking me if I had a facebook page and a twitter account, or if I could share other tutorials. It was exciting and confusing and completely unexpected. But the thing I learned the most from it was, I was creative. For years I’d felt like a fraud when people had told me I was so creative with painting. Because I knew I wasn’t. I had painting skills, but I didn’t have painting creativity. But with clothing, I felt that creativity. Real creativity that keeps you up at night because you’re so excited about a new idea. Creativity that consumes and motivates and pushes boundaries. It was so incredibly exciting and freeing that I’d found my creative passion. BUT…I still wasn’t very good at sewing. In fact, I was pretty terrible. And I still had no idea what to do with all these new blog followers. But I had motivation and passion that made me want to keep going, regardless of how many followers I had. I wanted to sew, and I wanted to share, and I wanted to learn how to put outfits together (even though I wasn’t very good at that either). So for the next few years I did a lot of sewing — mostly refashions — and styling, and a lot of Googling. Cause I had no idea how to be a blogger. When we moved to California in late 2012, right after Fos was born, I decided it was time to really push myself to the next level, because I knew that I really loved blogging, and I wanted to make it into something more. The biggest change I felt I could make was creating better content. I decided the best way to do that was to become better at sewing, and have better images. So for the next year, I really focused on that, and with these changes came more exposure, more connections, more opportunities, and increased growth. In early 2014 I attended my first blogging conference, in the hopes that I could take my blog to the next level. And this turned out to be a turning point in my career as a blogger. Up to this point I’d probably made less than $500 on my blog. On the first night of the conference we had a brand dinner, and we got to choose which of the brand sponsors we’d like to eat with. I chose Collectively, a brand new influencer agency, not really knowing who they were or what they did. It was a complete shot in the dark, but it has turned out to be one of my best blogging relationships to date. 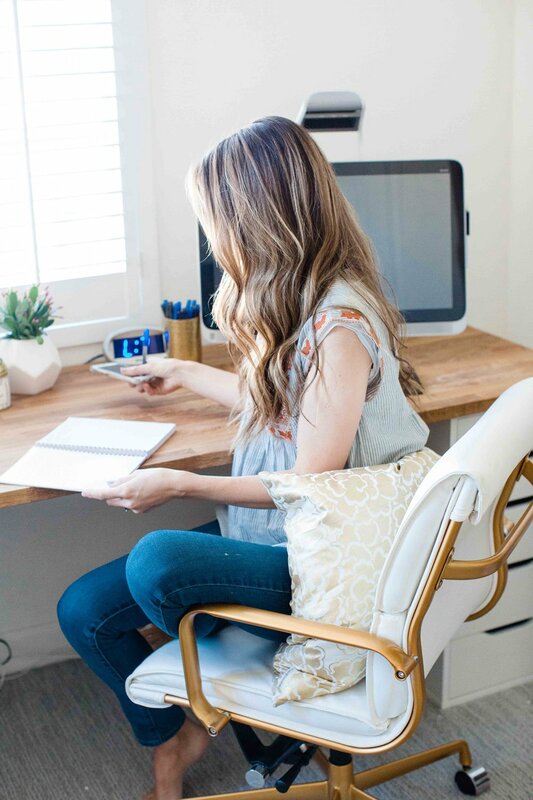 Whenever people hear that my job is as a blogger, the first question is, “How do you make money off of blogging?” And that’s where amazing companies like Collectively come in. They’re the go-between for influencers and brands, and over the last three years they’ve brought in a huge percentage of my sponsored content, and connected me with brands I’d only dreamed of working with. There are a lot of influencer agencies out there, and finding ones that fit with your niche and your brand can be difficult, and that’s what I love so much about Collectively. 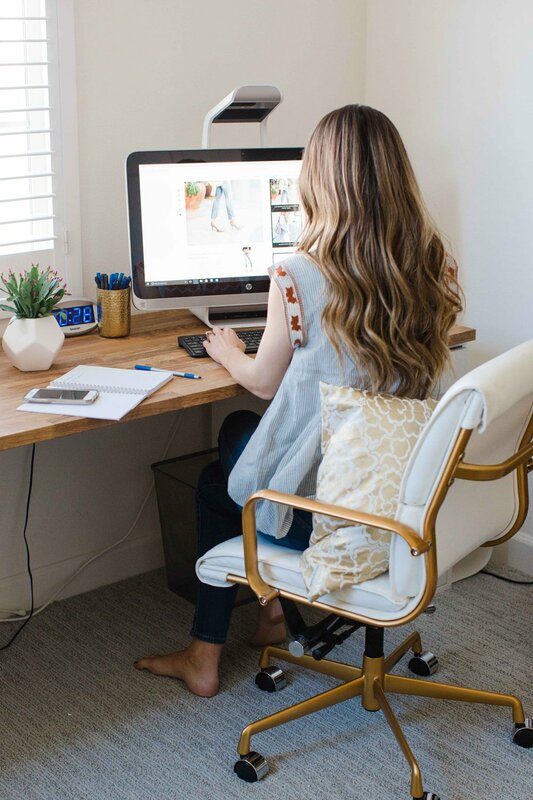 They have such a wide variety of both influencers and brands that they work with, and they’re amazing at connecting me, as the blogger, with companies and opportunities that fit my brand. As a creator and maker, I want to have time to do the creative stuff — not spend my time writing contracts or trying to manage payments and collections. So having a great agency who you trust, who wants you to be successful, and helps you stay true to yourself and your brand, is key in building a successful brand. I have recommend them to so many of my blogger friends, and if you’re trying to build your blog or brand, they’re an amazing place to start. As much as I cringe looking back at my old posts and photos, when I was taking my own pictures with a tripod in my bedroom, and then in the backyard of our condo complex, and then in random spots where I hoped no one would drive by, I also love seeing how much progress I’ve made over the years to get where I am today. I love seeing how my passion for sewing, and my drive for creativity and skill turned my little hobby into a job, and I’m grateful for the people along the way who have helped me turn this passion into a dream job. Oh my gosh ! I WAS around, and remember that polo shirt refashion! I also remember your bio back then which talked about your art, and I think you taught children art too maybe? You look so different too – you were always pretty but now you are super-polished & extra gorgeous! Hi there! I was googling blog posts about how to start an art career and somehow i fouND this poSt! What’s really weird is that i did not Specifically search for A mormon…and yet yoU mentioned in this same post abot being one (im one too) So craZy! Anyways i’m an artist, Wife and mother of four, aNd a military spouse that is trying to jumpstart my art career… how much WOuld It benefit me to blog as well? I’m thinking it would be a good aVenuE. Thanks for your post! Thank you for sharing this! I love reading your blog and love your style and am always so inspired by the pieces you create – wish I could do that! It’s so inspiring to hear from someone I look up to as a blogger talk about how they got started and how they turned a passion project into a career. After a failed blog (I just sort of gave up) a few years ago I have decided to give it another go recently (now that I’m a seasoned mama and know myself better and all – haha, yea right!) and it’s so very hard to put yourself out there in the hopes that others read it and like it and find it relatable! Thanks for sharing your awesome and cuteness with the rest of us! And congrats on all the success! I just saw your comment around it being hard to put yourself out there in the hopes that others will read it, right after I wrote almost the same thing, haha, glad to know I’m not alone 🙂 Have you restarted your blog already? I’d love to take a look! Thanks for supporting each other, you guys! I love this community so much — you are wonderful. Julia, i am not a blogger…just someone who loves a good fashion/lifestyle blog. You will always find people who relate to you. I personally love a blog where I can tell the writer is genuine and unapologetically themselves. A lot of people trying to get themselves out there try to be like other bloggers: do what others do, say what others say, be something theyre not basically. It shows when you do that. To read something that feels genuine is so refreshing these days when everyone is trying to beat the person before them. Just be yourself and you will find your tribe! There WILL be people who like the content you put out! Link your blog so we can all check it out! Good luck- I wish you well! I was around! I remember reading the blog after our first was born in 2010/2011! Loved watching your blog transform! I remember!!! I loved your blog even then. You’ve always been inspiring. I had wondered how it just exploded, thanks for sharing your story! Big congrats from a fellow BYU alumni!!!! Thanks for the background on your blogging story, yours is one of the few I check for new posts every day :)! I’ve been toying with the idea of starting my own for the past year and a half, but just haven’t been quite able to take the leap yet. Part of me is scared of putting myself out there and not having anyone care enough to read, any advice related to that? Thanks Merrick! Hi Jackie! That first step is definitely scary, and growth always takes time. But if you write about something you’re truly passionate about, it’s fun to share even as you wait for the growth. Good luck! What a fun (and interesting) read! And I love that polo refashion! I would definitely wear that today! I would too! I still have it — I need to dig it up and wear it again! Love to read about your journey. Those first refashioned post exposed me to your blog. I might have seen them much after the original posting date, but I have since enjoyed seeing and learning from you through your blog. Thank you for sharing. Oh, Llarlyne! Thank you for that sweet comment, and for reading! Hi Merrick! Thank you for sharing your story! I’ve been around for a few years now and I’ve loved getting to know you, follow along on your journey and seeing you grow as a blogger! 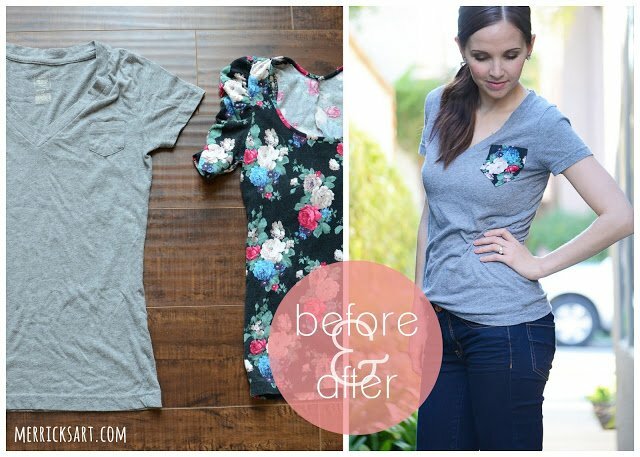 As a blogger myself, I would like to know how it is that you first came to sketching out your DIY sewing tutorials. What I mean by that is, how do you narrow down all of the step into about 5 short ones? My blog is about style and adventure. A few of my style posts are pieces I’ve made or refashioned. I recently made a dress ( http://www.overthebridge.co/yellow-batik-dress/ ) and wanted to share a DIY -but I’m always too afraid of not knowing how to draw it or not including enough detail (or worse, over-drawing.. AHHH!) Any tips on that would be great! Hi Bridget! Great question. I started illustrating my tutorials when I started sewing seriously and was sewing late into the night. 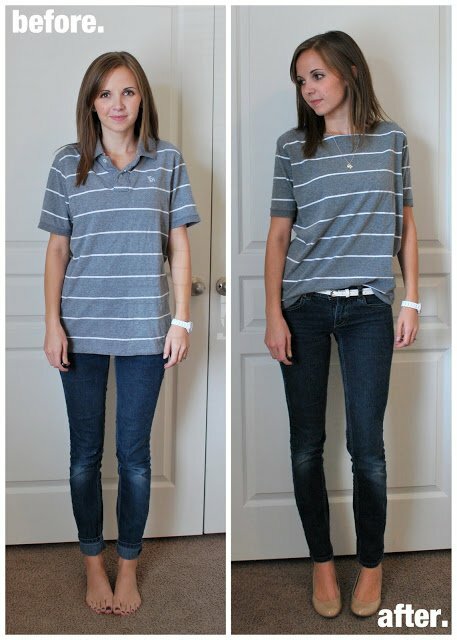 One, it helped me avoid ugly, dark step by step pictures, and two, it allowed me to streamline my sewing steps. Sometimes the instructions are different than the way I sewed it because I made mistakes and then show you guys how to avoid those. Does that make sense? It does take a lot of brain power to draw a 2-D image to explain complex 3-D processes, but it gets easier with every one. And I’ve tried to do more detailed sleeve, neckline, or bodice instructions in some posts, and then link back in the post to those so I don’t have to hash those out each time. Hope that helps! I remember those first posts. This was the very first blog I ever read! It inspired me to start sewing and although clothes were not my thing, I continue to make quilts. Amazing journey! Ah I’m so impressed by anyone who makes quilts! Thanks so much for following along all this time! I pinned that polo shirt pin and made my own version! I covered up some dumb embroidered company logo with a beaded appliqué and it was really cute! I have loved your blog at every stage and it inspired me to create my own. Thank you for the reality check- it takes years to grow; I need to be patient! This is one of my favorite posts of yours ever, ever. I have loved following along since the beginning. I must admit that I miss seeing your art because it was AMAZING, but I have loved even more to see how talented you are with this creative, successful outlet. Way to go, Merrick! You’re the sweetest ever, Monica. Love you! What an awesome story, I really always wondered why it was calles Merrick’s Art. Truly inspiring story. I have been following you as well for a long time. Who is taking your pictures nowadays? I have a few photographers I work with! I always share their names on the post or tag them on my instagram! I have a few photographers who i work with! Their names are always listed on the post, or tagged on my instagram photos! i’ve been following your blog since way back in 2011/2012, and i remember feeling so inspired by your refashions then and the approach to make something wearable out of something that no longer seemed relevant. since then, i’ve come such a long way in my own sewing, in a major part through your tutorials which have made sewing more accessible and relatable. most of my self-made dresses are merrick dresses! thank you for being a fresh and creative voice and for your thoughtful, classy presence. is it weird to say that i’m proud of you for all you’ve accomplished??!? anyways, thanks for sharing! I’m excited to see how you (and your family) continue to grow! I remember I had just moved out of province (Canadian) to attend my first year of design school when I came across your polo tutorial on pinterest and have been an avid follower ever since! I have attempted to take on a number of your diy projects and am now a graduated modern girl sew-er.. well, I may need to review a few things ; ) You have been an inspirational breath of fresh air in both my creative and personal life! I can only imagine how challenging it can be to expose oneself so openly on this forum, you have had a huge impact on many lives. Thank you for staying true to you and allowing us to be a part of your journey. You are so, so kind. Thank you for taking the time to write that sweet note — it means so much! I am seventeen and I love sewing clothes and I love your blog and instagram! In fact the first shirt I ever made was when I was twelve and it was your dolman top. I was so happy to find a tutorial that actually made sense. Your blog and creations are truly inspiring! Merrick- I have followed your blog for a long time. You are actually the age of my children, but I have been a seamstress for many years. I love your inspiration and I have made many of the pieces that you have given tutorials for, including the polo refashion. I do not follow fashion blogs because I find them very artificial, but I so appreciate your modesty in your fashion and your dedication to your family and your “real life” content. I am happy that you have been able to make a career of your creativity-keep it up and best of luck with what you are planning in the future. Thank you so much, Lynne! Your comment means so much. Thanks for the extra push to start my blog! I have one question: do influencer agencies like Collectively expect you to have a certain amount of traffic before they will work with you? I would imagine so, because you don’t have the role of “influencer” if nobody sees your site. Hi Elise! You definitely should start working on building your audience first, but I’d apply for Collectively’s agency soon after you start getting some traffic! This is the most helpful, simplistic “how I turned my blog into my job” post I have ever read…and I’ve read a lot. I’ve been following you for awhile and, unlike most, it was a post about your boys that first got my attention! I’m so glad to hear it, thank you!! Do you have a favorite blog conference you’ve attended? I’m trying to choose one to attend next year and I’m a little stumped as I’ve never been to one. I’m actually not an expert at all — I’ve only been to two! I started following you back in 2011. I even tried making my own version of that polo shirt. (it did not go well.) What I have loved about your site is the growth; not only in your personal style but also in your website. I absolutely adore your fashion sense and wish I had the mastery of the sewing machine for the beautiful dresses or the bank account for all the awesome jeans, shirts and shoes. As a mother of two little boys I fully support and am inspired by all that you do as work-at-home mom; especially the idea of getting ready each morning and taking the personal time. Keep it up!